I just put Sweetpea to bed. I laid with her until she fell asleep. And then I stayed longer... just watching her. It took all of my will to get up and leave her - sleeping there so peacefully in her own bed. Because Facebook was abuzz today with the news that yet another child passed away in the night from Type 1 Diabetes. I could think of nothing else all day. All day I had this constant dialogue with God. Which mostly just me, saying over and over again, "Please, God. Please don't take my baby. Please. I know a cure will come in Your time. But please hurry. Please." Other than that, I felt numb. Until I was laying in bed with my precious girl, talking with her before she went to sleep. Talking about her field trip tomorrow and what kind of birthday party she wants (her birthday is not until March - but she is planning ahead!). Then the tears started to flow freely. Onto her pillowpet and her fairy sheets. Onto the bloodstains that remind me that the same enemy that took this other young girl, lurks inside of my baby as well. Knowing that there is a mother who is not tucking her girl in tonight. This is why we walk. Why we raise money. Why I spend countless hours blogging, educating, advocating... Why I said "yes" when JDRF Advocacy came knocking. This is why we don't sleep through the night. Why we are always tired. Why we live in a constant state of stress and fear and anxiety. Why our personal needs come last. I have more to say on this topic. But now I have nothing left to offer up. I have nothing to share except raw emotion. Sadness. Pain. Sorrow. Guilt. Fear. Right now, I'm just so thankful to have my little girl. Alive. Breathing. Tonight I count my blessings. And I say prayers for the families who are dealing with my worst nightmare. Tonight I will check on my girl a few extra times. I will hug her tighter. And I just may sleep among the fairies. ** To read other posts on this subject, see the links below. (((HUGS))) to you and your sweet girl. I've done and felt the same today. Just blogged about it and have another blog post that will appear tomorrow. In fact, I've said some of the same things as you said here. This just hit too close to home. I am overwhelmed with sadness and fear. Putting Jack to bed tonight was tough! I keep checking on him. Oh Hallie...I am so with you. My post on The Hidden Truth almost went into the Unite. Advocate. Educate. bit. B/C that is what this has done. My fire is lit. The damn invisibility of this disease detracts from the NEED for a CURE. I love you. Please give Sweet Pea a hug from me. Lots of the same feelings here. I spent some time sleeping on Dora sheets last night, curled up with Lily. This kind of news just makes your heart ache! Big hugs for the entire DOC and especially for the family of our newest angel. I have not read the story yet. I knew I couldn't handle it right now. I did talk about it at work today, so I guess it was on my mind regardless. Hugs to you my friend. 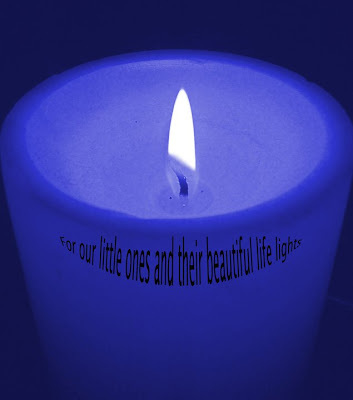 My heart aches for the families who have lost their children. Ugh....so thankful for friends like you. I feel like some of these blogging D Mama kids are part of my family. Sending my love to you my dear friend Hallie. This story has rocked our community...our resolve to find a cure is strengthened.